We are going to start using Git (not using it yet), and I want to define the workflow. We have 4 teams at 4 different global locations, developing together the same product. Each team owns a part of product's code, but sometimes they also have to make changes in the code owned by other teams. Is there a recommendation for a Git workflow for such environment? I have already seen this article, but the approach here is "we create additional branches as seldom as possible", and I believe more in "branch for each user story" approach. Also, this article presents a nice approach. I had in mind having a master branch, a permanent branch per each team periodically merging to master, and a per-user-story branches merging to the teams' branches. Does it make sense, or it wouldn't work? 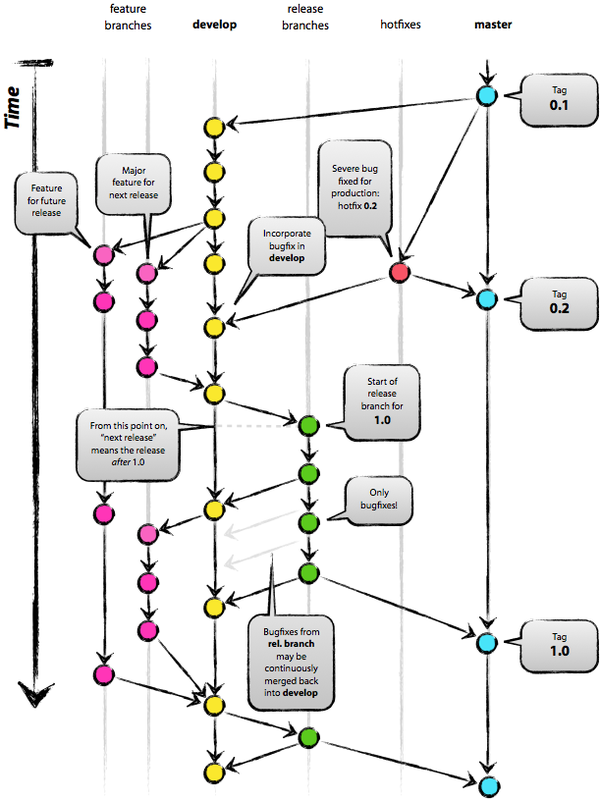 Take a look at Successful Git Branching Model, which has a nice branching strategy for feature development across releases. You could implement something similar with one extra level for team branches between the 'develop' branch and the 'feature branches'. Having team branches would also allow two teams to collaborate more effectively by merge between their team branches. I would say that each team has its own version of the repository, with one global repository where everyone commits to (like in Linux kernel, where the Linus repository IS the kernel and central repository). Then for maintaining the product code, you could use submodules like @larsmans said, then each team can only work mainly on the part that is most important to them and if they need to work with other part, they can do it to, but they will have to remember to update the submodule, and this is where the problem lies (since it is very easy to get things wrong when using git, thankfully it is also easy to get away from them). But since your teams are used to this, and are aware that they are changing other team code, it is easier for them to remember to do the submodule update, before changing a foreign module. github team workflow - to fork or not?